An unexpected journey to Tham Piu Cave (a.k.a. the “Missile Cave”) in the jungles of eastern Laos reveals humanity’s penchant for both destruction and compassion. Several years ago, I read about a cave deep in Laos where a single U.S. cruise missile strike in the 1960s killed 374 men, women, and children seeking refuge there. I was unaware of the historical context or geography of Laos at the time. To me then, it was merely another tragic Vietnam-war era story from Southeast Asia confirming the common “war is hell” sentiment, and I forgot about the cave for some time. 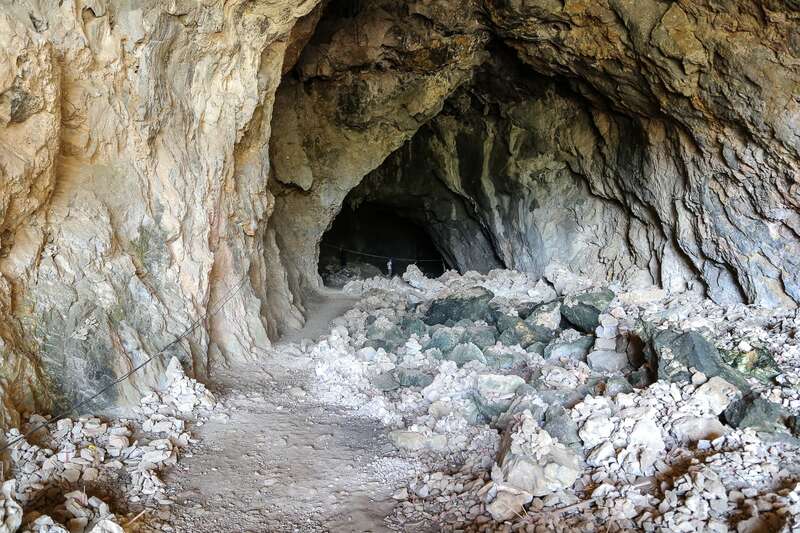 Now living in Laos, I came across the story of the cave again while preparing to visit Xiang Khouang, the east-central highlands province that bore the brunt of U.S. bombing campaigns intended to contain the Marxist Phatet Lao insurgency. The cave in question is near the Vietnam border, a good 60km out of town, along winding mountain roads. There isn’t a lot else to see around there if you aren’t on your way to Vietnam, and I wondered what business an outsider had visiting such a site at all. I’m not sure what exactly changed my perspective on visiting the cave. Unexpected emotions over the course of my stay in Xiang Khouang were building to a crescendo that was becoming impossible to ignore — a foreigner in a foreign land bearing the weight of a terrible legacy of war crimes in that country, and preparing to bear the weight of the legacy of a new administration for which I already felt deeply ashamed. There are numerous aspects of being an American that make me immensely proud. There are some aspects, however, that I find very difficult to grapple with, and it is those aspects that have made their way to the forefront in recent weeks. Even in light of all of this, it still wasn’t apparent to me when we arrived that the cave would factor into our short visit. 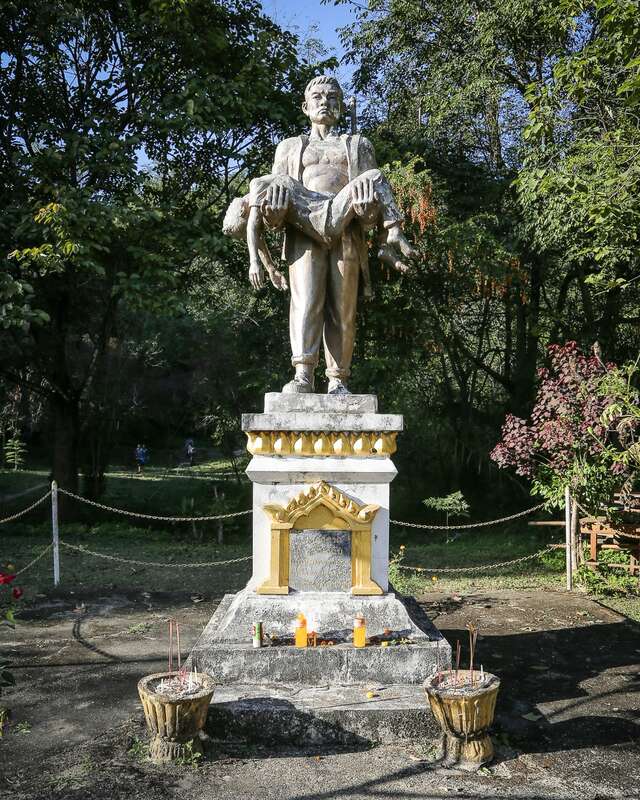 Then, one afternoon in Xiang Khouang’s cool and hilly capital, Phonsavan, I read that there was a memorial and Buddhist shrine at the foot of the cave in which villagers make offerings in memory of their family members who had died in the cave. For reasons I cannot adequately explain, visiting the cave suddenly became an imperative. My wife and I discussed our plans for Saturday morning and made our rounds to the various tour operators in the town center. Unsurprisingly, group tours largely focused on day trips to the nearby UNESCO-nominated Plain of Jars archaeological sites. Eventually, we found a driver for the day willing to take the three of us (my wife, infant son, and myself) to a couple of Jar Sites, the ruined former provincial capital at Muang Khun, and finally, the place that had dominated my thoughts over the past week: Piu Cave. 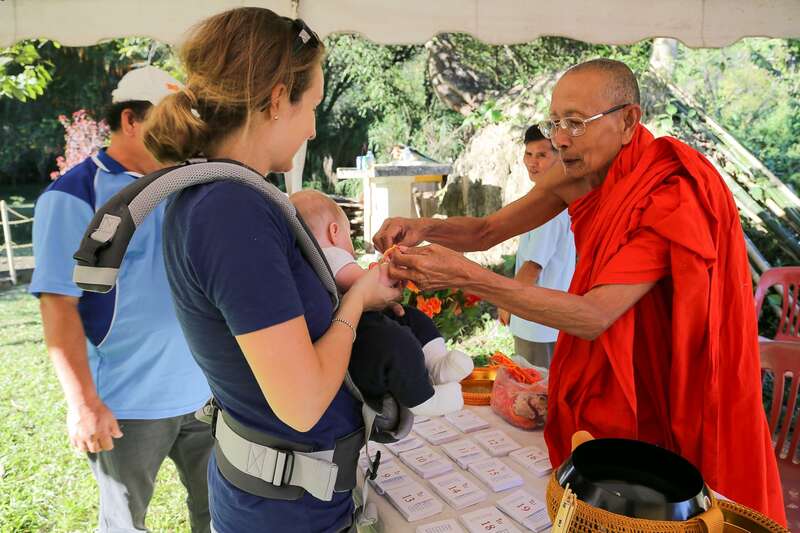 I had toyed with the idea of making the trip to the cave on my own, but ultimately felt that it was important for my five-month-old son and wife to be a part of the pilgrimage. It would make for a long day given that Muang Khun and Piu Cave were in opposite directions from Phonsavan, but the driver assured us it was possible. Our first stop, 30km southeast of town, found us in Muang Khun, former location of the centuries-old capital of Xiang Khuang Province (itself also once known as Xiang Khuang) and former seat of the Phuan Kingdom. The once grandiose city brimming with temples and shrines was reduced to rubble by U.S. war planes in the 1960s and 1970s. Old Xiang Khuang city was abandoned in 1975, but reincarnated as the village of Muang Khun several years later. 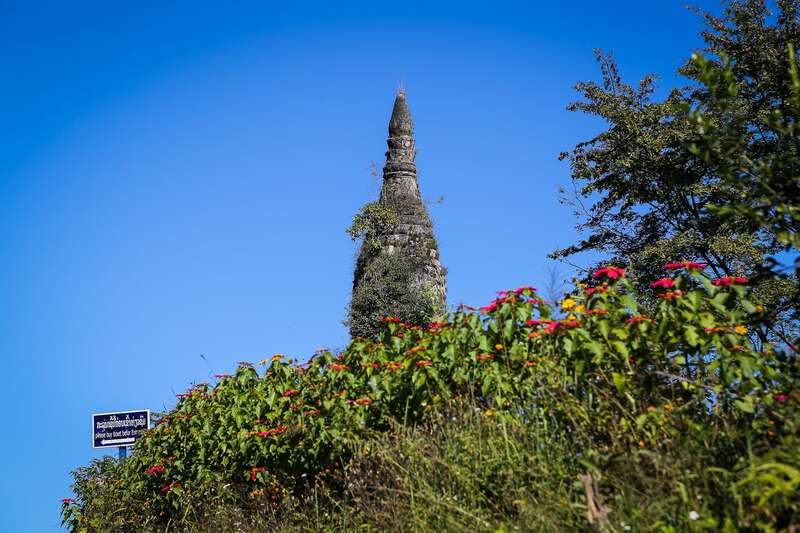 All that remains of the heart of the Phuan Kingdom is a handful of conspicuous ruins scattered about town, the most well-known being Wat Phia Wat. 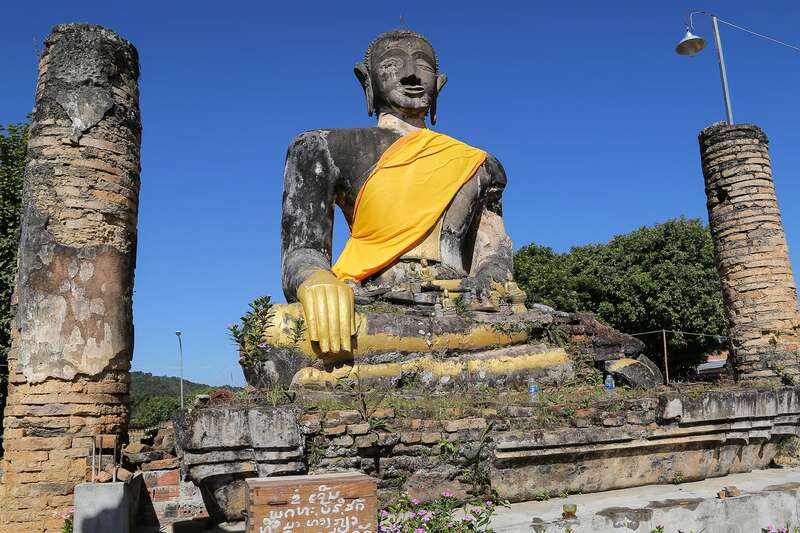 The most striking feature of Wat Phia Wat is the giant, seemingly pistol-whipped Buddha statue at the center of the crumbling temple ruins — a sobering testament to the devastation wrought by U.S. forces in the region. There are two ruined stupas visible from the center of town, standing high up on a hill — That Fhun, and the jungle-reclaimed That Chom Phet. 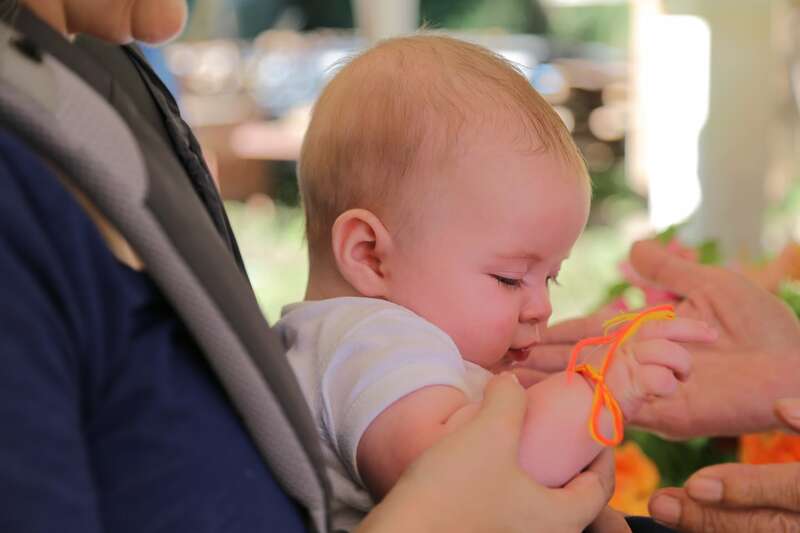 At the ramshackle ticket booth for That Fhun, the soft-spoken local lady taking money seemed very concerned that our young son was too hot (my wife had the carrier’s clip-on hood up to protect him from the sun, but was getting noticeably sweaty because of this). The woman insisted that my wife instead take her parasol to use for our son while out and about. 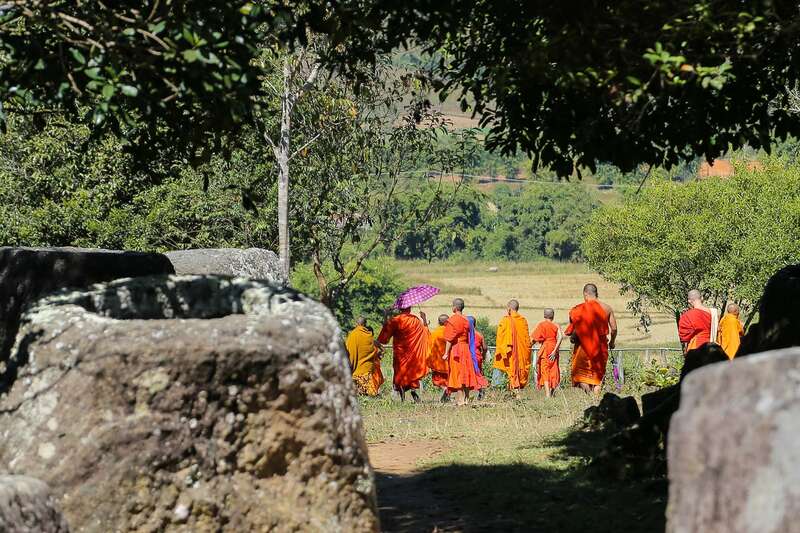 Our next two stops take us to the Plain of Jars, where we encountered a truckload of novice Lao Buddhist monks with roughly the same idea as us for a Saturday day trip. We run into the same group of monks at both sites and have a humorous exchange with them (in English) about how we arrived so quickly at the second site. As our driver had parked in a different spot than where their driver parked, they initially thought we had walked between sites, which would have been quite the feat given that about 6km separate the two sites and not more than 20 minutes had passed since we last saw the monks. Nonetheless, we all had a good chuckle over it. 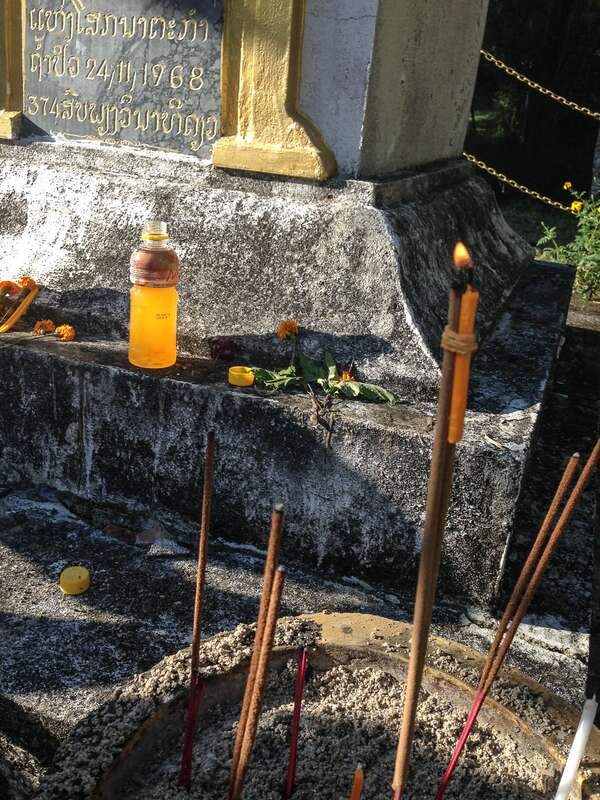 We bid adieu to the monks and jars, stopped for a brief lunch, then began the long trek north, back through Phonsavan and up into the mountains. The drive was rugged and stunning. About 90 minutes later, we arrived at our final stop of the day — Tham Piu (Piu Cave). At first, it was not at all what we expected. The field that doubled as a parking area was completely packed with vendor tents, and there was a flurry of activity on the periphery of the grounds. We had heard there was a small interpretive center for visitors before ascending the steps to the cave, but it was locked when we arrived. There were a number of caretakers about and, after some searching, our driver was able to find the one with the keys who promptly let us in. Suddenly, half a dozen other caretakers dropped what they were doing and streamed in to see what was inside. It was apparent that most had never entered the small building. The walls of the small room were covered with the story of the cave from the Laotian perspective, complete with graphic photos documenting the aftermath of the missile strike. Needless to say, the Lao government held no punches in putting together the exhibit, and to be honest, I think the decision was appropriate for what took place here. We left the center still a bit confused as to what all the activity outside was about. Then, on our way to the path up the mountain we passed the memorial and shrine and everything suddenly came into focus. The 24th of November 1968. Today was the 19th of November. All the activity around us was the local village community gearing up for commemorating the 48th anniversary of that fateful day. 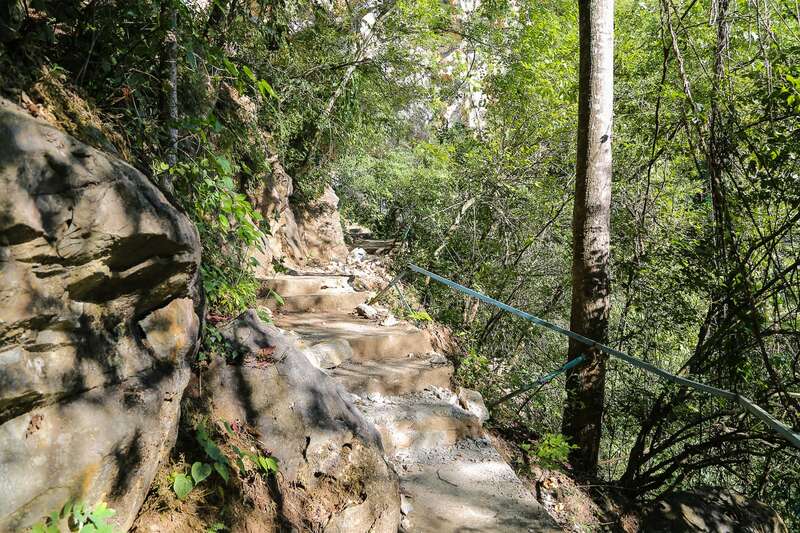 The path to the cave slowly ascended the mountainside via a series of stairs cutting through lush jungle, and some dilapidated sections required extra care to negotiate. After a short while, we reached the gaping mouth of Piu Cave. To say it is like no cave I’ve ever encountered would be an understatement. Upon arrival it immediately felt like something very unholy had occurred here, and not that long ago. 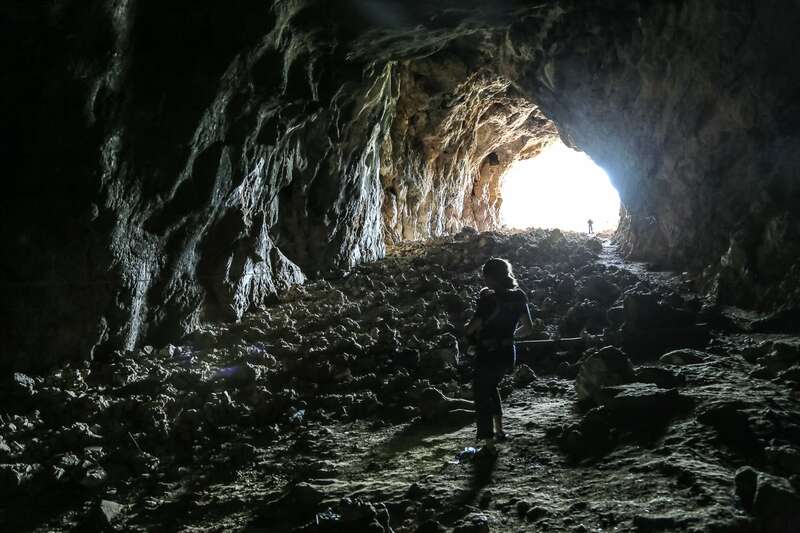 Nearly five decades on, the ceiling and sides of the cave still bore blackened scars from the missile strike, and the floor of the cave was carpeted in rubble, though some of the remnants had been made into cairns. On the morning of November 24th, 1968, daily life began much as it had for some time. Villagers now accustomed to falling bombs and rocket attacks in the region had long sought refuge deep in the extensive limestone cave systems of eastern Laos. Along with hundreds of men, women, and children from neighboring villages, rebel Pathet Lao fighters occasionally sought refuge in the dozens of large caves throughout the region as the insurgents made their way through eastern Laos. 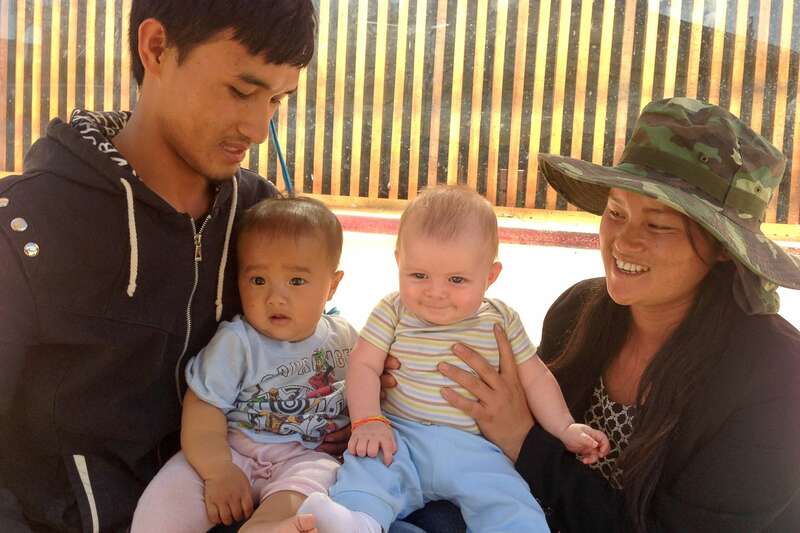 Most of the caves proved to provide safe haven for these individuals, but ultimately, Tham Piu was an exception. From where we were now standing, it was impossible to believe the cave extended another mile into darkness. In the black abyss falling away from the sunlit chamber is where most of the 374 perished, scorched from the missiles, buried alive from the cave walls collapsing around them, or over many days, entombed alive in the cave depths. Complete and total devastation. No survivors. This point is as far as I felt we needed to go. It doesn’t take long to get a sense of what happened here, and I saw no point in continuing. Back at the mouth of the cave, it’s easy to imagine how the cave’s elevated position left it vulnerable to a direct hit from fighter jets. It was common knowledge at the time that these caves provided refuge for hundreds of civilians, and Tham Piu was no exception. One quickly realizes that the number of insurgents seeking refuge here was likely inconsequential to U.S. forces. It was an easy target. On the way back down the hill, we took an alternate route that hugged the lush hillside. 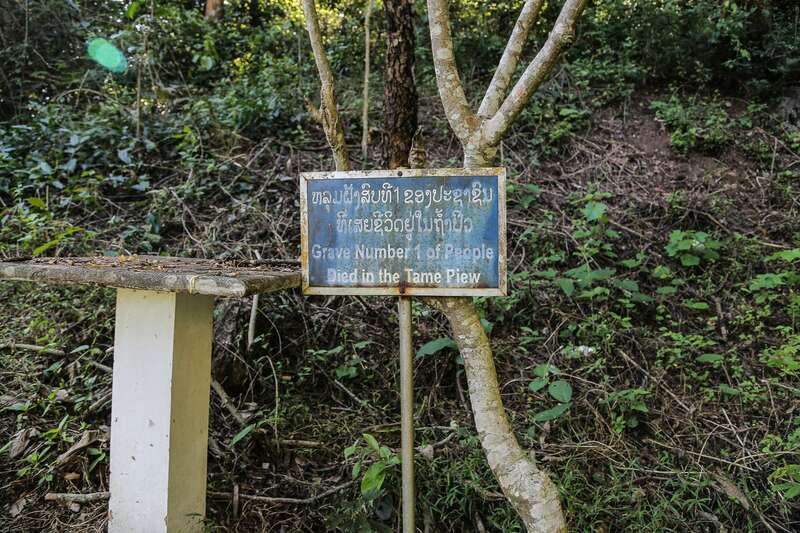 Along the path we noticed something we hadn’t on the way up — numbered graves of the victims of Tham Piu. 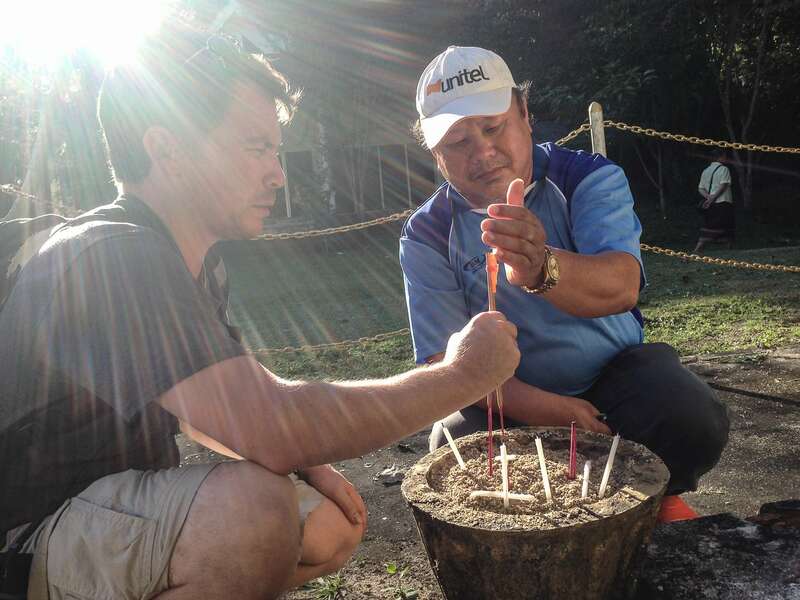 When we arrived back at the bottom of the hill, we began about the business of finding an offering to place at the shrine, which turned out to be a more challenging task than anticipated. We approached a couple of nearby monks, but they could only offer the papers used to write wishes and blessings on. A young man nearby seemed to understand what we were looking for and disappeared for a few minutes before proudly returning with three sets of incense sticks. The next item of business was to round up a lighter, which our driver was able to provide. The wind was blowing fiercely, making the primer candles difficult to light. Our driver knelt next to us and sat patiently for several minutes as the three of us fumbled around trying to light the offering. Finally, after what seemed like an eternity, we succeeded — the textbook definition of a team effort. It bears mentioning that not a single person helping us during this time spoke a lick of English, including our driver. But the objective was clear. Some things simply transcend words. We sat there in silence for a good long while. I wasn’t sure what else I should do, or if there was a particular Buddhist prayer to be said for this particular place at this particular time, so I clumsily cobbled together what I could and stood there in silence. What do you say at a time like this? All I could think about was how incredibly messed up it all was and how nothing I could do or say could change that. A part of me wanted to believe that being here said something, meant something, demonstrated something to the people around us — or to myself — but if so, then what? It’s not as if I, or anyone I know, personally pulled the trigger and it’s unlikely that our driver or these monks suffered a personal loss here. But perhaps we were all here today for something greater than memorializing and atoning for the sins of the past. I have to believe that there was more to this encounter than mere curiosity or national guilt. I’ve since come to terms with the realization that I may never truly understand what brought us here. But we were brought here, nonetheless, and that feels like enough for now. We were starting back to the van when our driver made a motion to go see the elder monk around the corner. He pulled out three yellow and orange bracelets and tied one around each of our wrists — right wrist for men, left for women. I looked on as he tied my wife’s and then my son’s, approaching the elder monk last to receive one, myself. My infant son cannot fully comprehend the significance of this moment. But then again, I’m not certain that we adults can either. He won’t likely remember this either. But whether he remembers it or not the important thing is that it happened, and that he was a part of it. Regardless, our son was unusually solemn through much of our visit to the cave, so perhaps I’m not giving him the credit he deserves. So where does that leave us? Honestly, I really don’t know. All of this will undoubtedly take time to process. What I can say is that what seems to have left the greatest impact on me from that day has surprised me. When I think of that day’s journey, I keep coming back to the inexplicable kindness of the strangers we encountered along the way – the soft-spoken woman who lent her parasol, the befuddled novice monks, the cave caretakers, elder monk, and our driver, and many others – who had every reason to treat us far differently than they did, but instead welcomed us with warmth and generosity. 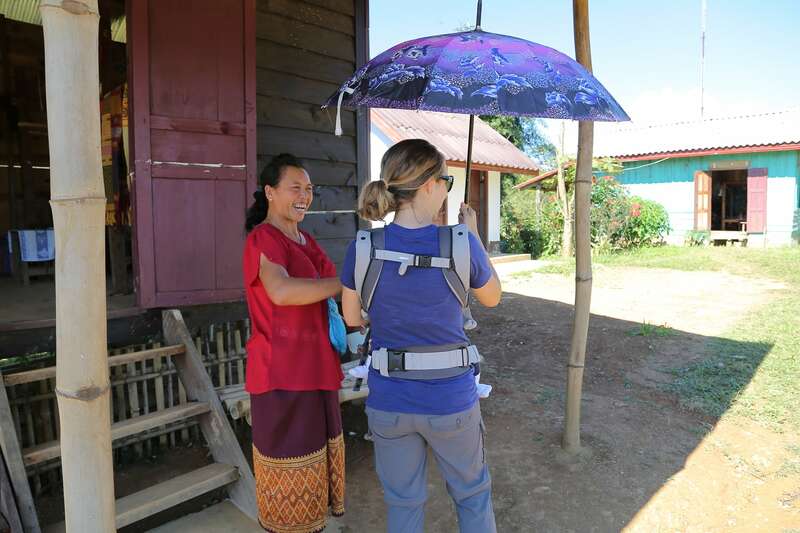 We have rarely been shown anything but kindness from the locals in Laos, particularly in the poorest areas. Whether or not they know we are American or whether they took the U.S. side or fought fiercely against the American forces generally makes no difference in how people treat us here. I’d like to say this makes me feel better about things, but it doesn’t, really. Most of these people, living amongst the rubble of their ruined kingdom, working in their unexploded-bomb-laden rice paddies — with their maimed neighbors, husbands, sisters, children — have no reason to treat us the way they do, and quite frankly, we don’t deserve to be treated so well. But they do it anyway. It’s karma, it’s instinctive, it’s Laos. It’s just how people are here. And the fact that I find it all so incomprehensible perhaps says far more about my own native culture than it says of theirs.